It is a good thing that the 1933 "live action" movie of Alice in Wonderland opens with paired photographs of the characters and the actors who play them. With all of those masks, how would we ever find Cary Grant, Gary Cooper, and the others? This is a movie to watch. If you love Alice in Wonderland, watch it. If you are entertained by your favorite actors doing unusual things, watch it. I fall into both categories, and I will admit to watching it mostly for Cary Grant. I am still a far way off from my goal of seeing all of his films. *Alice is declared to be a volcano when she picks up some chess pieces to move them in an attempt to be helpful. *And the reason for my watching this movie: "Or shall the mock turtle sing?" Four stars for a great story (of course), fun costumes, and actors who seem to be enjoying themselves in their silly costumes. I hope to see this again. Cary Grant sings FCC Regulations ("Dinosaur Gardens" blog, 2006) Oh, fun! I've never heard of this version. 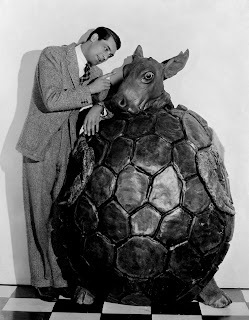 Cary Grant was in it? Looks great. It was a lot of fun to watch! This is the only movie on your blog I have heard of. I have never seen this version, but I loved the Disney version. As for the recent version with Johnny Depp. I have not seen it yet. I had heard it was not as good as the Disney version. I will have to look into finding this version and try to watch it. Have you seen all 3 versions? Which is your favorite? Angie, I have seen all three versions. I can tell you quickly that the Johnny Depp one is definitely NOT my favorite, despite my great love for him. I might like the Disney version best story-wise, but I really appreciated this 1933 film for the strangeness of seeing some actors I love in really odd costumes. Probably the truest answer is that the original book is my favorite version. I loved the disney version and I was really excited to see the Johnny Depp version, as well, but had heard so many bad reviews on it. After that I really haven't put any effort into seeing it, but your right about the original book, this is usually case with any book or movie.